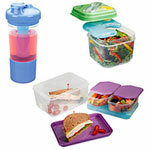 The Lunch Set is all you need to pack a nutritious lunch. 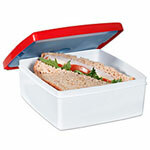 Lunch set includes a bottom compartment to hold a sandwich, salad, entree or last night's leftovers. 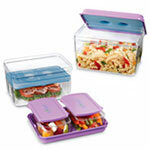 Two 1-cup small containers to hold your favorite sides and snacks. 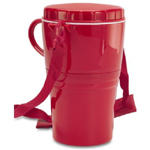 Use the set without the two small containers and it can hold up to 8 cups of food. Removable ice pack clips into the lid which can be used as a plate. 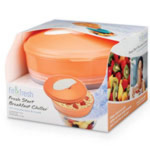 Lunch container is easy to clean, top rack dishwasher safe, and can be frozen or microwaved. Note: ice pack is not dishwasher or microwave safe. Meets FDA regulations for food grade plastic. BPA free. Color of set may vary from picture. Other color available is green. Measures 7 1/4 in l x 5 1/4 in w x 4 5/8 in h.